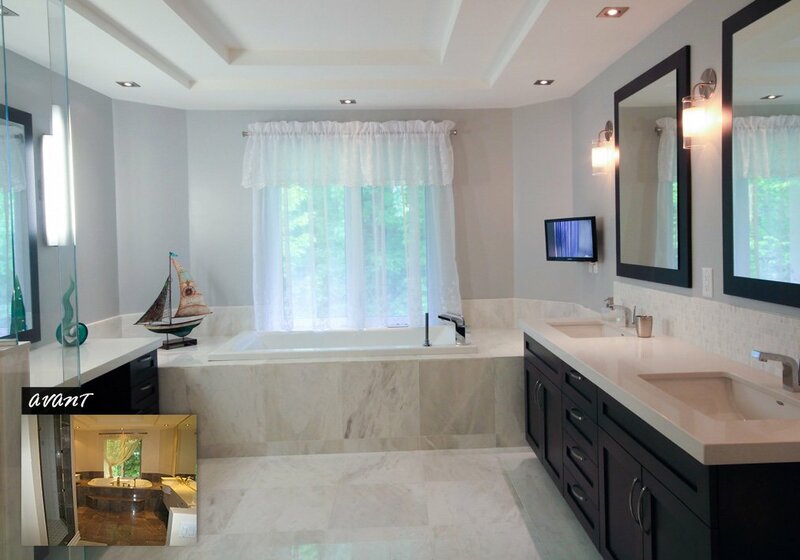 Discover this magnificent luxury bathroom renovation project in a Verdun residence in Montreal. 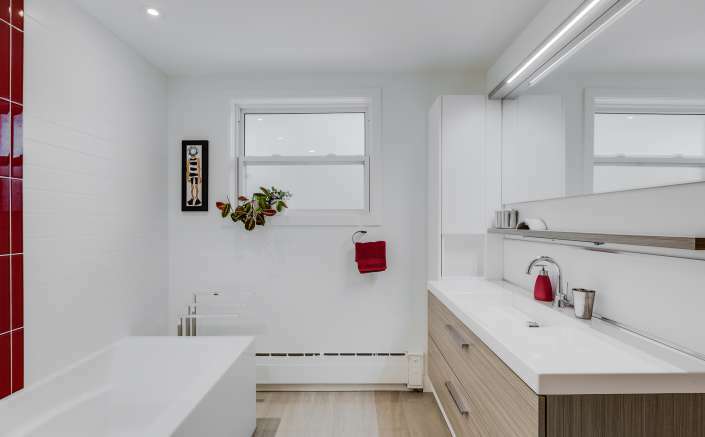 You too can benefit from our expertise as a general contractor specializing in bathroom renovations, and also from our turnkey renovation services. Call us for a free consultation! Our job leads us to work on multiple bathroom renovation projects and we do it with passion every time. For this bathroom, our client wanted to make major modifications to his original bathroom, while maintaining its luxurious and classic style. Before beginning the renovation work, we first carried out a partial demolition of the bathroom. We removed the black natural stone floor, removed the vanity and mirror, removed the shower and even knocked down a small stone wall that the client considered unnecessary. Since the customer wanted to be able to enjoy a television screen in his bathroom, electrical repairs were done. Also, with the addition of two sinks on the vanity, we had to do some work on the plumbing. The renovation work could begin with the refurbishment of the floor. We have replaced the black natural stone with a white and grey marble floor. The original vanity has also been replaced by a custom-made vanity with black melamine cabinets, a white ceramic counter with two separate sinks and new faucets. A second, smaller vanity has also been added for more storage. The built-in shower has been replaced by a glass door shower. The shower is equipped with an additional jet shower head and a telephone shower. The shower walls are made of white ceramic. 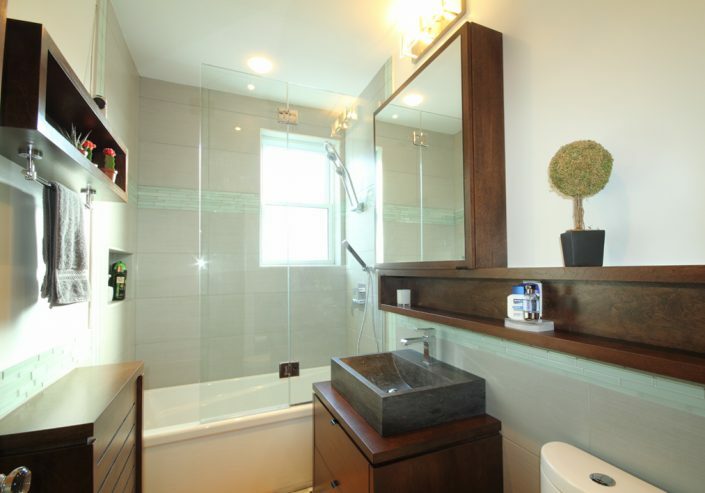 As a general contractor specializing in bathroom renovation, it is our duty to support you at every step of your renovation project, regardless of its duration or size. To do this, we have established long-term partnerships with plumbers, electricians, cabinet and counter manufacturers, and designers to make your project a success from start to finish. 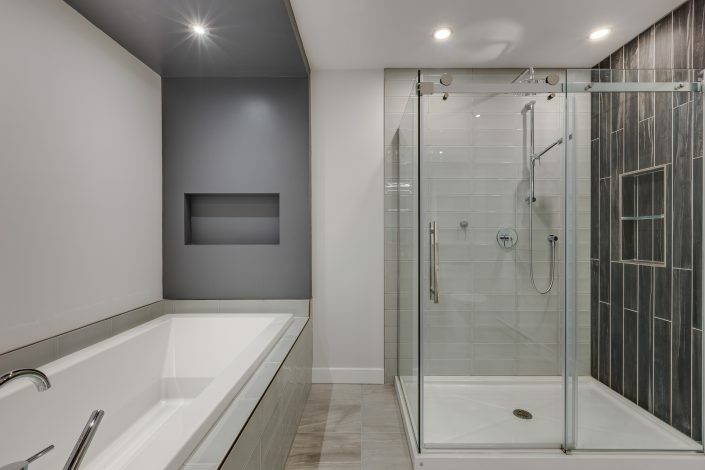 If you want to know more about this luxury bathroom renovation project in Verdun, our turnkey renovation services, our prices, or our services, we invite you to contact us by email or by phone. Your first consultation is free of charge! Our team will be happy to welcome you and answer your questions.